To debone a chicken, you must have a tender touch. We do not hack, rip or rush through the process. Carefully peel the skin from the meat and then the meat from the bones…treat this chicken with respect. It seems like a simple skill, but what is it worth, exactly? It’s worth everything. Particularly when my mentor, Kim Beckham, Director and Chef Instructor of CPS Café, can tell me where and how this particular chicken was raised based on subtle characteristics in the appearance of the meat. She explains how the dish Chicken Scampi is named after the shape of the cuts, and that thickness should be uniform for ideal baking. There is wisdom in peeling a potato properly or coaxing a batch of Hot Potato Salad with Tarragon to the perfect texture and consistency before putting the finishing touches on the flavor. Sometimes it seems as though the whole operation is a physical manifestation of Kim’s food mastery, but in reality it’s much larger than that. The CPS Café is a system within a system—as dependent upon the local farmers, stolid university structure, and conscientious consumers as they are on us. We do our best not to disappoint. On a given weekday, the bags and boxes of colorful, aromatic produce roll in one end of the Café and a plethora of tantalizing dishes are created for our customers who gather daily in anticipation of the new and exciting options which await them. This transformation from produce to delicacy is carried out inside the kitchen by Spencer the Boss, Anna the Prodigy, and a host of other student artistes on the forefront of a localized, responsible food production system. We bumble through the kitchen in fast forward as the world turns and the community functions outside, meshing into a beautiful and harmonious equilibrium. The system is no more perfect inside than out. Buns get burned and brownies mangled, just as tractors get stuck and crops freeze. The director gets mad and students panic. Ingredients run out and substitutions are made. Efficient though we are, some days feel more like choreographed chaos than clockwork precision. These imperfections, however, constitute the glory of the final product. By final product I mean finished dishes, of course, but keep in mind the cyclical nature of the operation, as compost returns to the fields and bones become the precursors of delicious stocks and soups. Again, a system within a system. Each flavor underlying each individual ingredient comes down to the technique of the people who cultivated the land, nurtured the plants and tended the animals, along with the team of students who boiled, broiled, peppered and pureed. Ultimately, the responsibility for each of these dishes falls on numerous community members, each playing their part in this fundamentally intertwined web. Lest we forget that the garlic started as a seed and the chicken an embryo. To ignore the multitude of simultaneous and integral transformations taking place as seed becomes salad would be a grave injustice. The chicken, having been adequately nourished and appropriately raised, is butchered, shipped, seasoned and baked before meeting its (again, not final) fate beside juicy lemon slices atop the glorious Scampi. The faculty or staff member, coming in drained and craving a timely and nutritious meal, walks out with a belly full of goodness and a mug full of coffee—ready to transmit the knowledge of his/her passion to the next generation of engaged citizens. The farmer, placed at the forefront of the collective consciousness by numerous active individuals and organizations, is transformed from food producer to local businessperson—nourishing a community of thankful recipients. And of course the students, starting as mere employees and transforming into Associates—associated with a higher order food philosophy which breeds passion for quality, appreciation for ecology, and awareness of social justice through the context of wonderful food. I do not know all of these people outside the CPS Café, nor do I need to. Through our Café association alone, I am assured that they know what I know. Chicken Scampi is more than an enticing entrée; it is the thread underlying delicately intertwined systems of biology, agriculture, community and education—permeating the bounds of the larger Stevens Point Community and the world as a whole. It is, in short, everything. Lee Bartnik is a Dietetics Major at UWSP. In 2015, Lee received both the Chancellor’s Leadership Award for his leadership and service to the campus and community and the Albertson Medallion Award, the highest award given by the University. 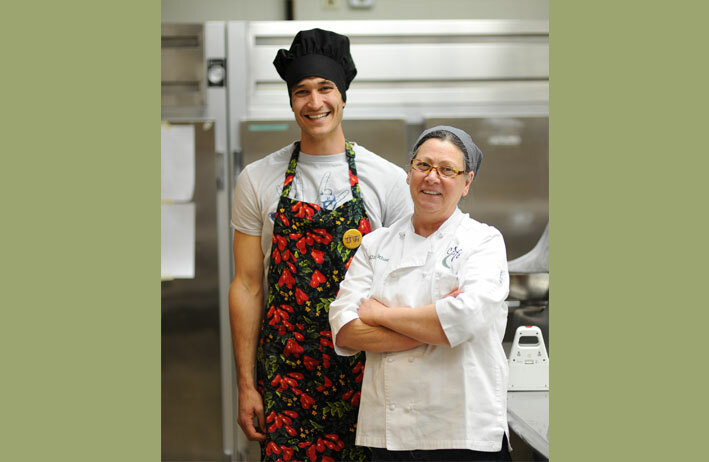 The CPS Café is a unique food business that provides hands-on training to dietetics students and focuses on healthy eating choices. The food is sourced from sustainable local farms in our region. Great essay in the intricacies of the system woven together by Kim and made functional through your dedication—along with the rest of the staff—to learning, leading and transforming our campus’s relationship to community and food. This article is so well written and has peaked my interest in Farmshed as well as UWSP CPS Cafe! I plan on visiting and learning more about each! Revisioning Point shared a photo. Revisioning Point shared a post.